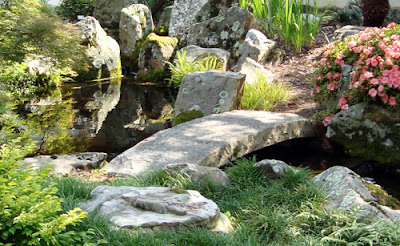 This weekend, Saturday and Sunday, May 20-21, 2011, the Atlanta Bonsai Society will hold their Spring Show at the Atlanta Botanical Garden. I'm excited about attending this show because they are featuring Suthin Sukosolvisit, renowned for this masterful Bonsai skills since the 1970s. I've attended the Bonsai Show in previous years and they always have a spectacular display of truly amazing Bonsai. And if tradition continues, there will be demonstrations, as well as Bonsai trees, pots and other Bonsai gardening supplies for sale. There's a lot going on in the Atlanta Botanical Garden this weekend, including music, tomorrow's Cocktails in the Garden, featuring the Atlanta Opera, and cooking demonstrations in the Outdoor Kitchen as part of Gourmet in May, yet another fun Garden program. Of course, while you're there, stop by the approaching-50-year-old Japanese Garden (photo), certainly one of my favorite spots at the Atlanta Botanical Garden.